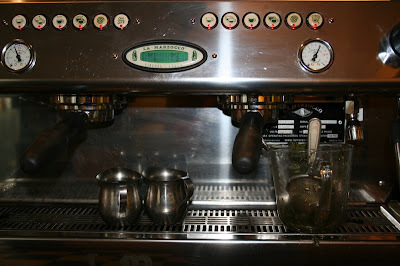 There is an espresso machine like this one (pictured above*) at my workplace. I see it several times a day -- whenever I go to the restroom, whenever I wash my coffee cup, and whenever I grab some drinking water. I always know it's there, and I know exactly where it is. A few months ago I was washing my coffee cup at the sink, less than foot away from the espresso machine. A co-worker came up to me and politely asked if I could step aside so that he could tip his coffee into the sink. I smiled and took a step back, towards the espresso machine. In so doing, I pressed my upper arm into the "steam wand" of the espresso machine. For those of you unfamiliar with espresso machines, the steam wand is the pointed, stainless steel valve that releases a gush of hot steam to create the milky froth required for cappuccinos and cafe lattes. It can heat a cup of milk to 150 degrees in less than 10 seconds. It gave me a sizzling second degree burn in less than 1 second of contact. The skin on my arm first became red, then bubbled up into a hot blister of the same shape as the steam wand. According to the medical advice available on the internet, I discovered that one should go immediately to a hospital emergency room for treatment of any second degree burn larger than 3 inches in length. Looking at my arm, I estimated that it was closer to 2 inches, so I slapped on a band-aid and went back to my desk. The burn eventually healed, but I still have the scar. Ouch! Didn't the blister stick to the band-aid?!? No, thank goodness. But it did take a long time for the blister to go away -- two weeks? I was very tempted to pop it the whole time.